Using version control has become the default position in the programming world, and with good reason. Code checked into version control doesn’t get lost, the entire history of the code is available for viewing, you can tell exactly who has changed what and it allows for parallel development. Developing on Siebel is not your typical programming project though. For one, the entire codebase (configuration, scripts etc) is stored in a database and not flat files. This means that using version control with Siebel is not as valuable as using it in a programming project. It’s also more difficult as version control isn’t well catered for by Siebel Tools. The Siebel repository is the ‘code’. Version control is just a way to track changes made. Build the SRF from files under version control. You’ll still need to do this based in the Siebel repository. Easily rollback changes as with other IDEs. You will need to import the sif files automatically generated by Siebel Tools. See who changed an object, what they changed and when they changed it. You will be able to see an objects entire history, as opposed to the default Siebel behaviour of simply telling you who last updated the object. I used TortoiseSVN. It’s easy to use, and has a graphical as well as command line interface. This file is executed by Siebel Tools each time you check in an object. It is not set up for Subversion by default. You will need to modify the variables in the “User defined parameters” section of the file. Siebel Tools will call the batch file below twice for each object selected for check in. The first is to do a check out, the second is to do the check in. This means it’s not a particularly efficient mechanism, and only one file will have changed between each revision in Subversion. It does however do the job. The DIR parameter was passed in with enclosing quotes by Siebel. This meant I couldn’t tack on the repository name to the path. I stripped the enclosing quotes and assigned the new path to the DIR_NO_QUOTE variable. I’d prefer to specify where my local copy of the repository is located. I do not want it to be in the Tools temp directory by default. Allowing the developer to have full control over the location allows for the use of multiple repositories without having to delete or move working copies. The WORKING_DIR variable defines where the local copy of the version control structure is stored. I also didn’t rely on changing the current directory and favoured using absolute paths instead. From now on, changes you make to objects will be stored in the version control repository when you check into the Siebel repository. If you’ve got any comments, suggestions or corrections, let me know! The sparse Siebel Bookshelf documentation. This entry was posted in Programming and tagged Siebel, Siebel Tools, Subversion, SVN, TortoiseSVN, Version Control. Bookmark the permalink. Please take a look at our Siebel version control tool it is tailor made for Siebel and has a db repository just like Siebel. 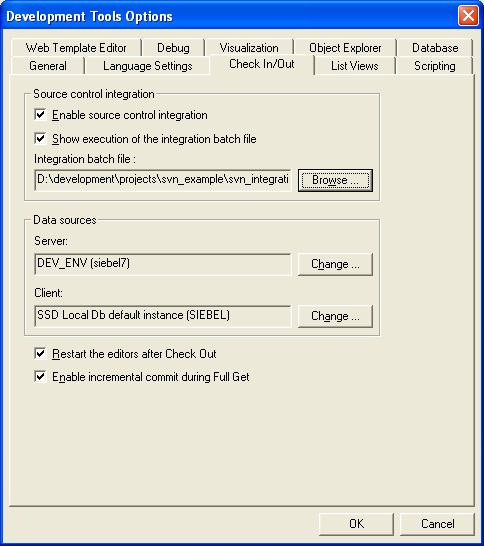 is it possible to branch multiple branches used for development in svn when using siebel. in a multiple release projects, is it possible to set up multiple branches for different streams and merge them while giving a release. There is a one to one relationship between a Siebel repository and an SVN directory. So if you made a copy of the repository, you would make a copy of the SVN directory or branch it. You would not eventually merge the SVN branch as you would not merge the Siebel repositories. Because an SRF is built from a Siebel repository and not Subversion, you cannot do branching , merging and releases as you would for a Java project. I am not a Siebel Developer at all. I have experience with source control and was asked if Siebel applications can be version controlled in SVN. I have read the article but I am unsure about the following. For informational purposes, how do you promote code from environment to environment in Siebel? How do I copy my code from localhost to a server. Surely this artefact can be versioned? Thanking you in advance for any advise offered. Yes, the files that are version controlled aren’t as useful as in other environments (Java or .NET for example). They’d give you some idea of what had changed, but that would be about it. You’d compile into a srf (the equivalent of a war file in a Java environment) that would be promoted to different environments. The srf file can be versioned, but just as you use an artifact repository rather than version control for jars, you’d probably do the same for srf files. You can make copies of the repository itself which would give you some of the same features a branch would. Could you please let me know what steps needs to be covered prior to placing the above modified srcctrl.bat file you have provided. because i am facing an issue with the same. I used the above file on my Siebel Env, enabled the ‘source Control Integration’ on Siebel Tools as well and tried a checkout and checkin, but here though checkout-checkin was successful it didnot create a copy of the object in teh version control repository. Can you post any log file data and process output that you have? I just saw this post and thought of expressing it here. Have build a Tool called SSCRiM (Siebel Source Control & Integrated Release Management) that would Version Control all the 3 entities that need to be Version Controled ( Siebel Objects , Master Data & Files) per Sprint/Release. It also generates build accross multiple release / sprint (bundles srf + repository.dat + Delta Changes in master data + files) which is then consumed by our another tool call “Deployment Automation” which would deployment this Pack/ build that was generated. – Configuration Management and build is very easy and less time and efforts consuming. Current limitations are it does not support ADM packages (soon it would). Could you please share experience (if any) for using Siebel code/ SVN version control/Jenkins automatic deployment? 2)developer logs in the Sieble adminstrator of deployment server to deploy the SRF into dev environment. If Development testing is OK.
My another Question: Does deployment team have to create scripts to deploy SRF to Test, Acceptance and Production? Can you please share deployment framework for Siebel? -the use of svn with siebel tools can allow to us to use branches (trunk, branch 1, …) and specify them somewhere? can we create a new branch before that? can we report a specific fix on a specific branch? Thanks for your article. Loved it. I hope you don’t mind that I essentially just modified your srcctrl.bat for our purposes. What I am wondering is, though, once you’ve got the srcctrl.bat file plugged into Siebel correctly, what is the correct way of making a first commit? Is it just that the next time you change an object, everything will be pushed? How to import siebel repository in SVN ? Hi ,I am new to svn ,we have integrated svn with siebel tools .For svn server we are using Apache svn and for svn client we are using Tortoise Svn ,your blog was very helpful in integrating the svn with siebel tools . 1. When we check out and check in an object,the log file getting generated is only having the check in object details and not check out ,why so? 2.When we simply check out an object and not check in does that objects sif file also gets stored in svn server repository and our local client repository . 3. Say i want to do some changes on an object ,that objects latest sif file is not present in svn server repository ,so after doing a check in the objects sif file with latest changes will be reflected in svn server repository.My point is how can i get my changes back if my latest changes have issue ,because this object past sif file is not present in svn,so how is svn useful in this case ? John on IT Cuties and Code Babes – Why Oh Why?